How Low Can Your Kitchen Window Go?? 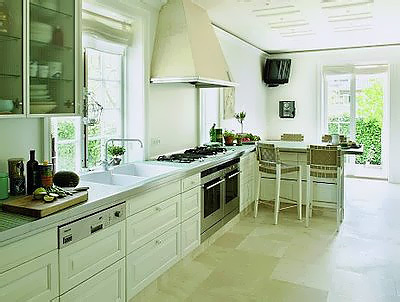 I was reading other blogs and came across this image of a kitchen. There is only the one shot, but I have some thoughts about design and aesthetics that I'd like to share with you. The image is from Terramia, a great design blog I frequent. I think what first struck me was the feeling of light in this image. I'd like to focus on the windows and where they are situated. They nearly touch the countertop. This is a major factor in the aesthetics in this kitchen. It appears to be a nearly invisible transition to the outdoors in a very effective way. I assume the window just over the eating area is at the same height. It's difficult to see. Will the flooring be changed? Does the subfloor have to be changed? How thick will it be? Will the subflooring be leveled? What flooring material will go in? How thick is it? Will there be any sort of adhesive material below the floor? How thick will that be, for example, a mud or thin set application? Will the mud tile installation be leveled if the subflor will not be? What is the high point of the room? What is the low point of the room? Will the cabinetry have to be shimmed? (answer..always). By how much? Is some sort of sill or casing below the window desired, or none at all? What will that dimension be? How thick is the countertop material? How is the window constructed? Who, all. will be the players in all of this labor and design decisions and are they giving reliable information or communicating maybes?? What if the window is put in too low?This, in all honesty, is why you rarely see this application. It's risky, very risky! To me, it's not just nice, it's fantastic. I was glad to have come across this design element in Terramia. It is a design detail that would have been far from my radar screen to discuss here. I'd love to know what you think of this type of installation.